The problem with Adret 740A signal generator was the disappearance of the output signal at the N output in the upper power range. Sometimes the signal was present for several hours, sometimes it would disappear for a few minutes after switching on, sometimes there was no signal at all. However, at the control output on the back of the instrument the signal was present all the time (0.5-1.2 mW depending on the frequency and attenuator setting). While searching the web I found the complete instructions for use with all the schemes on page http://boulayp.free.fr/f6iib/ (Page requires log in) from where I took the schemes. What I found on http://www.bobford.plus.com/finished.htm was a false trail for me – even though it contains a description of repairing a very similar defect of Adret 740A. I suspected the problem originated in output attenuator (page 19). It works in such a way that attenuators of a specific attenuation range are switched off by internal relays from the approach board (17a). +12V voltage on the relay means that the attenuation is zero, no voltage means nominal voltage attenuation. To check the voltage on the specific relays, one has to check the voltage on the ribbon cable that connects the VHF board (33b) and the doubler (if you’re in possession of Adret version 740A to 1200 MHz) or is attached to the casing of the attenuator (for 560 MHz version). On the VHF B board, voltage goes through another ribbon cable to relays from the buffers (LM324) on the approach board. Unfortunately, the numbering of the connector 26 pin ribbon cables does not correspond to the numbering on the scheme, but to its mirror image, so finding the voltage going to the specific relay attenuator requires some attention. To simplify the search, we set the output level of +13 dBm (maximum signal) which means that all the relays in the attenuator are powered . In my case, it appeared that there was no +12 V voltage to the relay one of the attenuator 30 dB. The voltage goes from the LM324 (described as SN10 on the scheme). More specifically, the voltage goes from the operational amplifier located between pins 5,6 and 7. When active, the amplifier should be about 12 V on pin 7, 4.2V on pin 6 and 5.2V on pin 5, the off-state voltage at pin 5 and 7 is 0 volts. In my case, the voltage at pin 5 fell from 1.8 to 2.4 V, which resulted in an uncontrolled switching on 30 dB attenuator. Cursory inspection of the elements showed that the pin 5 resistor is 100 kΩ is OK and there is no short circuit on the 0.22 μF, which suggested a failure of LM324. After careful desoldering of LM324 (important note – printed circuits are sensitive to longer heating), adding a 14-pin socket (for easier replacement) and replacement of LM324, I noticed that after 10 minutes of normal operation, the output signal disappeared again. I managed to find next 5 pieces of LM324 manufactured by different companies that exhibited similar symptoms – output signal sometimes was present, sometimes it disappeared. After ruling out the microdamages of print tracks, what remained was -the last item – 0.22 μF capacitor, which could be damaged. After replacing it with a new one, my Adret 740A started working properly! As it turned out – after connecting the 12VDCvoltage to the desoldered capacitor, it showed unstable leakage current of 3-10 μA and the ohmmeter showed unstable internal resistance of 1-4 MΩ, and the capacitance meter pointed from 0.14 μF to 0.16 μF depending on the temperature. There are many blue capacitors on the PCB, but I decided not to change them. ADRET 740A has a good signal stability, which I have used recently in experiments with TRV at 24 GHz, as a 105.473 MHz signal source (x228 = 24,048) to the oscillator circuit from the 23 GHz radioline from the DMC (white box), used by me as a bacon control, as well as the oscillator for the conversion of 24 GHz/432 and 24 GHz/1296 (after changing the frequency of the generator to 107.320 or 103.579 x212 x228). I will be qrv from JO80JG 1130 m asl. p.s Beacons SR6XHC, SR6KHC and SR6GHC active. Zapraszam do zapoznania się z materiałami dotyczącymi budowy transwertera 24 Ghz. Materiały znajdują się pod tym linkiem (format .pdf, 2 MB). 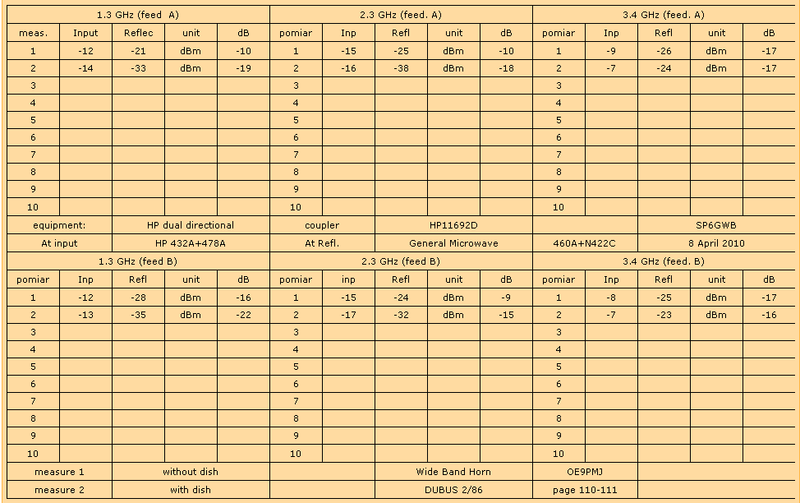 Measurement of wide band horn OE9PMJ on 1.3, 2.3 and 3.4 GHz without and with 1.4 m dish. Two separate antennas measured. 1. Click the picture below to enlarge the measurement table. 2. 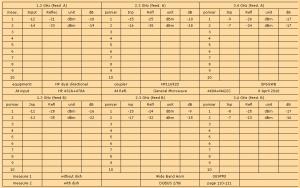 Click here to see the measurement table in PDF format. W tragiczni weekend wraz z SP6JLW i SP6OPN byliśmy w Tri Studne w OK2. Po dokonaniu paru zakupów, wysłuchaniu kilku referatów wróciliśmy do SP. Spotkaliśmy znajome twarze i postacie, potwierdziliśmy zaproszenia na Zjazd Techniczny w Zieleńcu, który odbędzie się 13-15 sierpnia 2010 roku. Stanisław Ziemczonek SP6GWB Home Page. Ilośc wpisów: 14, ilość komentarzy: 17. SP6GWB. © 2019 All rights reserved.